The main objective of this paper is to review the literature on and compare the lifecycle costs of full sanitation chain systems in developing cities of Africa and Asia. Overall, financial cost reporting methodologies have been inconsistent and many studies only focus on capital costs or do not report cost data on desludging, transport and treatment. In addition, a comparative analysis of raw cost data across cities and countries would be of low utility, owing to the numerous determinants of costs (e.g. density, level of service) and their high sensitivity to local contexts. To circumvent this, this paper compares the cost ratios between different sanitation systems analysed in a same study. It concludes that conventional sewer systems are in most cases the most expensive sanitation options, followed, in order of cost, by sanitation systems comprising septic tanks, ventilated improved pit latrines (VIP), urine diversion dry toilets and pour-flush pit latrines. The cost of simplified sewer systems is found to be lower than both conventional sewer systems and septic tank-based systems, but lack of data prevented further comparisons with other types of sanitation solutions. sanitation system, soil condition, energy cost and others. “Others” include distance to treatment facility, climate, end-use of treatment products, business models, water table height. There are many independent variables that will impact calculation of cost. In the determinants noted above, “labour” will have varied impact. In Pakistan, for example, the labour is cheap, relative to, say, labour costs in Germany and USA. There are other important interventions, like health, ability to pay, willingness to pay. Having said that, the author rightly says in the abstract - financial cost reporting methodologies have been inconsistent - a comparative analysis of raw cost data across cities and countries would be of low utility, owing to the numerous determinants of costs (e.g. density, level of service) and their high sensitivity to local contexts. Last Edit: 07 Jun 2018 15:06 by muench. I agree this is a useful paper. Your review is stimulating and delightful. 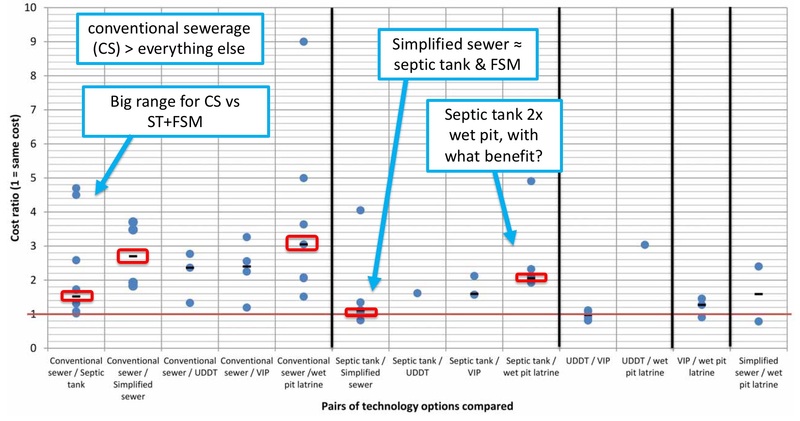 Daudey’s review that conventional sewer systems are the most expensive solution, followed by a tie between ‘septic tank & FSM’ solutions and simplified sewerage, and finally various ‘pit & FSM’ solutions; seems pretty reasonable, if I were to look at it from my experience here. There would be, however, some variations from one country to another, in the developing regions. In developed countries, cost variations are expected to be significantly different.